Binghamton is back! But the bad news is that the struggling Senators have our number, and we’ve not played well at home. Should we be confident? Or, are we Snowblind? 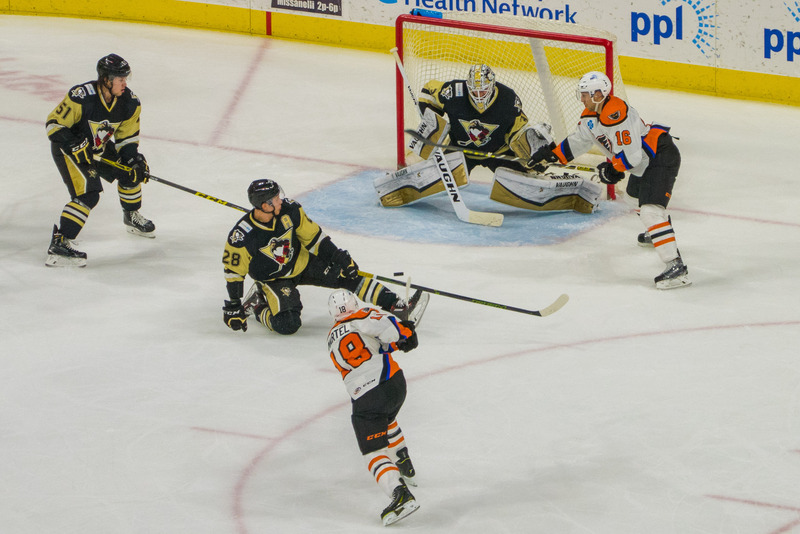 The Phantoms left the PPL Center on 16th of January, having lost to the Wolfpack and having lost the last five games in a row and seven of the last nine at the state-of-the-art Allentown arena. 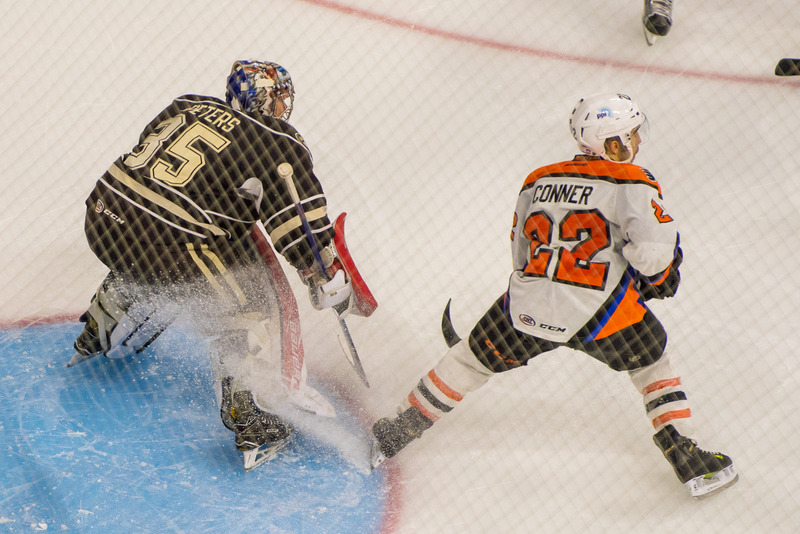 They went up the coast to Bridgeport on Sunday 1/17 and got a much-needed win behind the goaltending of veteran Jason LaBarbera and goals from Leier, Conner, Martel and Goumas–a 4-1 tally. Snowmageddon pushed Saturday’s contest in Hershey back to Monday, where the Hamilton Street Heroes emerged victorious from a wild game, winning 6-5 via shootout. 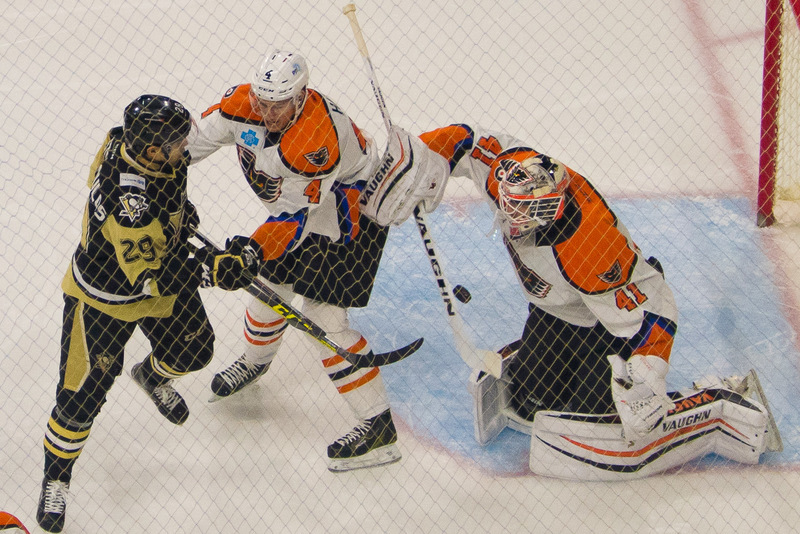 Both teams had 3-goal bursts, and the Phantoms relinquished a two-goal lead in the third. Nevertheless, Hershey is not good at shoot-outs, and we got our two points while allowing them one. Stolarz in goal fended off many shots and breakaways, despite the 5 goals allowed. Bardreau with two goals got the number 1 star of the game, but reports out of Hershey had Taylor Leier, wearing an ‘A’ in Brent’s absence, with a very strong game. The home losing has cost the Phantoms in the standings: They’re not the worst team in the division, but it’s getting close. Still, there are some holding out hope that an extended hot-streak could propel the team back into playoff relevance. If that’s going to be a possibility, they’ll need to win games like tonight’s, versus the league’s weaker teams, at home. Tonight, the Phantoms 21st-ranked Power Play unit will face off against the Senators 20th ranked Penalty Kill. On the flip side, the Phantoms 12th-ranked defensive unit will play against the Senators 10th-ranked Power Play. We know the Phantoms are abysmal at home at this juncture; the Senators equally abysmal on the road. Unfortunately, I think two of their only 5 road wins have come at the PPL Center. You may recall, Def Jesper Pettersson has been reassigned to Reading. You also may recall, team goal leader Petr Straka is more seriously injured than we first thought. Def Matt Lashoff was released from his PTO contract. Def Adam Comrie was added from Reading. He’ll wear #36 this season. Forwards Kevin Sundher and Geoff Walker–long since forgotten it seems–have been skating in some capacity at practices. Forward Philip DeSimone–a lefty-shooting centerman–was signed to an AHL contract. He had been playing in Austria. He’ll wear #10. He is not deemed a veteran by AHL rules. My sources tell me that he’s a strong offensive player. Coach Gordon may use him on the left wing–as below. Veterans Andrew MacDonald and Tim Brent missed Monday’s game with “ongoing injuries” termed “day to day.” AMac is thought to be closer to returning, of the two. Aaron Palushaj is back in the lineup after getting some possible injury time or veteran scratch time or both. UPDATE! F Tim Brent having wrist/hand surgery today. This should put him on the shelf 6 wks or so. UPDATE! F Pavel Padakin and G Martin Ouellette recalled from Reading Royals. Reading also played on Monday, where they lost in overtime. Before that, they were 2-3 in their last 5 games. It’s not helping them in the standings, either. However, they have been struggling with players coming and going both to/from the Phantoms, was well as guys getting signed to PTO deals with other AHL teams–as is the rule in the ECHL with players not on AHL contracts. Once again, the Binghamton Senators and our old friend Zack Stortini are in town. Tickets and Parking: Plenty of good seats are still available for this game. Phantoms VIP Experience tickets appear to be sold out for many of the upcoming games. Parking tonight may be more difficult than on a normal Wednesday night: The snow has driven many of the normal street-parkers into the decks and lots. Check the real-time parking app or have a back-up plan as you head uptown tonight. The Parking Authority tells me that we should stick to the decks, as lots and on-street may still be covered with snow. Let’s hope they have the sidewalks passable; that was their one weakness last season during the snow days. I’ve also heard that meters will not be checked–but I’d be cautious about moving someone’s lawn furniture if I were you. UPDATE: Some concern from those who have talked to people who work downtown–however, word this afternoon is that the streets are clear in the arena district. Leave a little extra time, but I’ve been assured things are fine down there. No professional lenses are permitted. The Smoking Area, located at the Northwest Gate, will open at puck drop and will close at start of 3rd period. Ticket required for re-entry. Rosters: Please print page 2–or pagess 11 and 12 from the Media Kit .pdf above. Broadcast: TV-2 and AHL-Live($) for video; AM-1470, IHeartRadio app, phantomshockey.com, and FM 89.9 (real-time feed inside PPL Center) for audio. Promotion: “First Responders Night” –no giveaway. Pregame: TV pregame goes live at 6:30PM from the sound stage at Chickie’s and Pete’s. The radio pre-game usually starts a bit earlier, about 6:15PM for your drive in, on AM-1470. We’ll see if I have a companion for the Noise Nation pre-game meal: if so, perhaps Crust–you know I’ve never been there? If I’m alone I may head back to Bell Hall or crash with the Phan Club Pholks at Chickie’s. Last game, Mrs. Kram and I went back to grain. Good service and food as was the case the previous time we were there. Prices were very fair: We had a gift card and couldn’t even use it all up, so we’ll be back of course. The pork belly tacos were the highlight! Mrs. Kram did some book shopping at the Moravian Book Store on the way to the game. Once again, Community Deck near the intersection of 6th/Hamilton is an excellent place to park when you visit the East Hamilton establishments–especially if you’re coming from the South, as we were. …last time versus Bingo. Look for the Phantoms to try to capitalize on rebounds. I don’t know if this will be the same goalie as last time out, but that was the game where the puck was laying there in the slot and no one seemed to be in a hurry to get to it. Look for that to change–these players and coaches are too good to let that go, and if I can see it, for sure they can too. Look for more strong play from the “kill” unit. They’re playing very well, and it continued Monday night. They killed four power plays in the first period, and got a shorty. They killed another in the second, and scored a power play goal. They killed 4 more in the third, gave up a PPG, and scored a PPG. Despite the two PPGs, the man-advantage looked disorganized at times and even took a “too many men” penalty. Look for that to improve, especially if AMac and/or Brent are able to come back. Look to see how Comrie does on the PP. Also watch his shot: He has an absolute howitzer with laser sights. I look for him to get a goal tonight. Watch Aaron Palushaj. He was looking good prior to his injury/scratch. Look for him to press the issue and take some good shots tonight. Tyrell Goulbourne has been quiet lately. Look for him to make some noise tonight. His birthday was yesterday. Is snow in the forecast again? 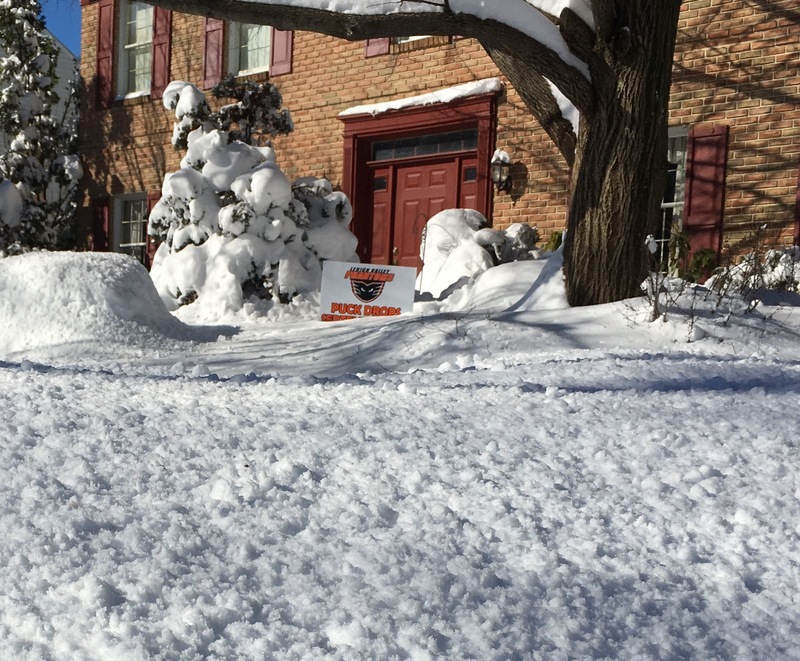 If so, look for Chickie’s to have a “snow day” either today or Friday–all-you-can-eat snow crabs! I got my money’s worth when they had that last season, I’ll tell you. 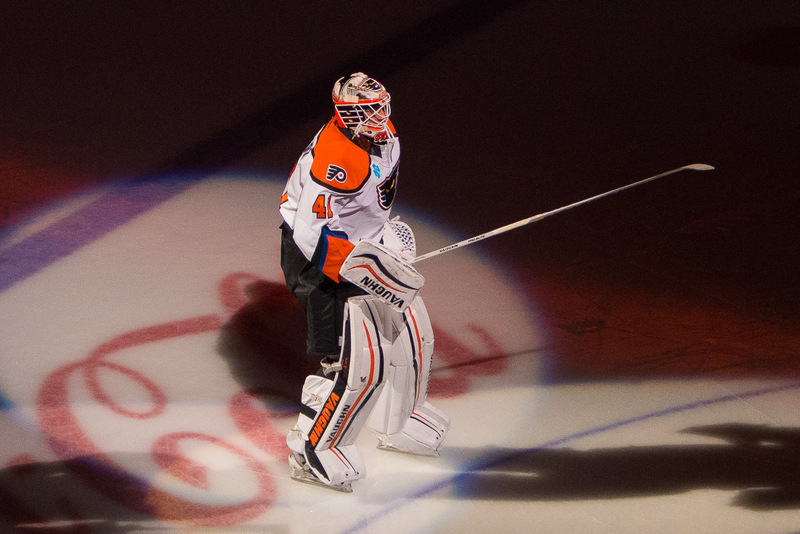 ICYMI: The Phan Nation Phan Club is now the “Official Fan Club of the Lehigh Valley Phantoms.” Read my article here. Visit their website here. Give them a ‘like’ on SpaceBook here. Season ticket holder gifts (a very nice, unique, pint glass) continue to be distributed at the team tent near the Tim Horton’s entrance. Have your tickets with you. This will continue until the end of February. Season ticket holder carnival–a really nice event last season–has been scheduled for Sunday March 6. Stay tuned for more details. Read my review from last season while you wait. So it seems there will be a bubble hockey tournament at the All Star game in Syracuse. And we’ll (Phantoms) be represented. But by whom? No mention of a tournament for fans, so far, that I’ve seen. Watch out for something last minute, tonight or this week. We’re right back at it on Friday, as the Penguins are back in town again. It’ll be another poster night (3 of 4, marking 20 years of Phantoms hockey) and I’d expect the Phantoms to sport those black and purple throwbacks, with the Pens in white. I think the Pens may have a red/white alternate, too, which could be used. On Saturday, the Phantoms complete a home-and-home by heading up to Casey Place for a rematch of Friday’s game, before All Star break starts on Sunday. Stolie and Cousins head to Syracuse from there.